This is a project in which children will learn the importance of human lives and how to reduce disaster impacts such as earthquakes, volcanic eruptions, wildfires, floods, hurricanes, landslides, tsunamis, droughts and so on through the communication and collaboration with global friends. As the final event of the NDYS2018, we will get together in Niigata, Japan with collaboration with iEARN Taisho Koto Project. We would like to have a workshop and presentations there. 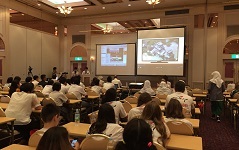 NDYS was first organized in Hyogo in May 2004 and started from September 2004, commemorating 10th year of great Hanshin Awaji Earthquake, Japan in 1995. We learned the importance of human lives and preparedness for disasters. In recent years, it has been pointed out that extreme abnormal weather caused by climate change may be linked to an increase in large-scale natural disasters. Natural disasters such as heavy rain and floods are increasing in many parts of the world, and they become major obstacles not only to people痴 lives, but also sustainable development. To take urgent action to combat climate change and its impacts is an urgent global issue. By experiencing various disasters, different knowledge and information to reduce their impact are accumulated in local communities. By sharing this knowledge and information, we can prepare against future disasters and take actions to combat climate change and its impacts. Let us maintain continuous efforts and transfer these efforts to the next generation. Our ultimate goal is to enhance awareness of the impact of natural disasters on families, schools and local communities around the world through young people's actions. NDYS will build a global disaster management education network utilizing Information and Communications Technology (ICT). Let us communicate with each other and contribute to the healthier planet. NDYS has several programs. You can select one or more programs which fit to your school curriculum. 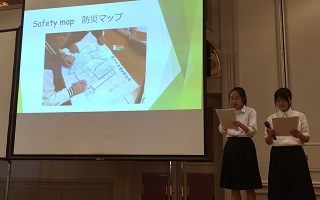 Students will create a Disaster Safety Map of their school痴 surrounding areas. Students will conduct research on the environment near their school and put this information in the map, including both safe dangerous zones, as well as placed they love and are proud of communities. Send the photo of completed disaster safety map to ndys@jearn.jp. 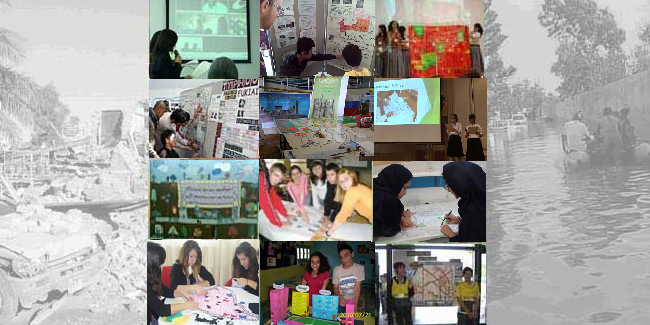 You may put your map on the Gallery of iEARN Collaboration Center, too. Students will have discussion through Video-conferencing and on the iEARN forum of NDYS. the NDYS Teddy Bears (NDYS Little Ambassadors) will be exchanged between partner schools to strengthen the friendly bond at the NDYS conference. The schools accepted the bear will inform what activities the bear did in their school by photo and students diary. Each School can make Kid痴 Safety Bag (Emergency bag), too. Students who want to tell their experiences, lessons or suggestions learned from the past natural disasters can put messages on the NDYS forum. As you may know natural disasters leave behind long-lasting and severe trauma. Music can have a beneficial effort in helping people recover from Natural Disaster. It will be wonderful, if we can share such music. As we believe the healing power of music, NDYS has decided to collaborate with iEARN Taisho-koto project from 2015. We would like you to introduce the music of your country which heals people痴 hearts and makes people happy and alive. It will be ideal if you can send us your video or upload it onto YouTube. We will practice and play music through videoconference once a month. We would like you to play the music at the NDYS gathering in Niigata, Japan. 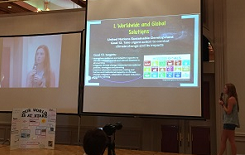 As the final event of the project, we will get together in Niigata, Japan. We would like to have a workshop and presentations there. We plan to host a gathering in 2018 in Japan. This will be a collaborative gathering with iEARN Taisho Koto project, Kotolympic. We will make an exhibition of maps and oral presentations. Through this program, students will grow as global citizens who take actions and share their knowledge of disaster management with local people. We expect students to be NDYS Ambassadors to let people understand the importance of preparedness for the potential disasters. Their schools will be the center of community education for disaster management. We welcome teachers and civic volunteers to support students' learning and activities. NDYS welcome the original activities done at your school or community. If you have any original activities, please introduce them on the iEARN NDYS discussion forum. Websites created by NDYS students, PowerPoint presentations, booklets, websites in different languages, safety maps, and a big friendly family of teachers and students. Project contributions to Others and the Planet. Children and the youth will share their knowledge and work as leaders of their communities. -They will help people in trouble as global citizens. They will learn how to save their lives and make their environment safer. 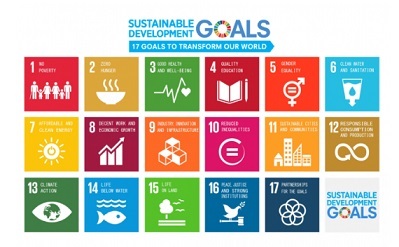 This project will directly contribute to the quality of life of anyone who lives on this planet by sharing the information of how to reduce damage by unexpected disasters and building the Disaster Management Education Network utilizing ICT.